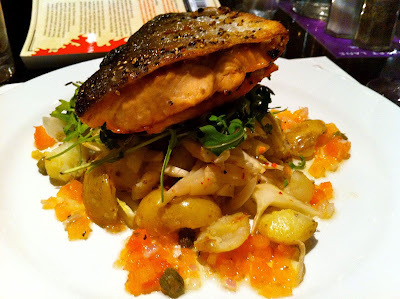 In November 2011, I reviewed Market Lane in Cork. The constant churn of diners and buzz in this Cork restaurant highlighted that this was a locally popular venue, although I came away a little confused. Maybe we just hadn't ordered the right dishes, but the whole affair seemed too busy for my liking. I recently returned to Market Lane, this time dining on the Early Bird Menu, and I'm glad to report that the streamlined options available suited me much better than before. The Early Bird offers great value with 3 courses (plus tea/coffee) for €20.00 and is available Sunday 1-7pm and between 5-7pm Monday to Thursday. With 4 starters and 7 main courses to choose from (including sea trout and ham hock), there is plenty of choice on offer. 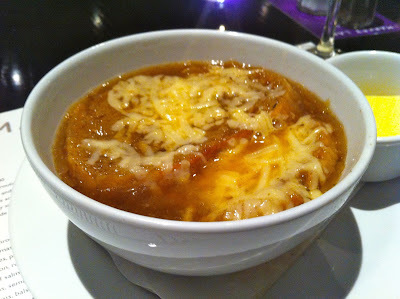 I decided to go with some lighter options, so I kicked off with French onion soup served with Gruyere cheese and croutons. The soup was sweet with the taste of caramelised onion, and strings of melted cheese hung from my spoon. A slice of homemade brown bread and the large swimming croutons went untouched as there was more than enough in the soup itself. I asked for the pan-fried sea trout with fennel citrus salad, crushed baby potatoes with tomato and caper dressing. Unfortunately, there was no trout available that day, but I was offered the same dish with salmon. Two crispy, skin-on tail fillets were a little overcooked for my liking, but still moist and well-seasoned. They sat atop an Everest-sized mount of fennel pieces and crushed baby spuds. The diced tomatoes and capers were a nice contrast to the fish, but there simply wasn't enough on the plate. On the menu, this choice gave the impression of being a light fish dish, but there was no shortage of food here. In order to round off your dinner, the Early Bird offers a scoop of vanilla bean ice-cream, fresh fruit or a mini chocolate pot along with a tea or coffee. 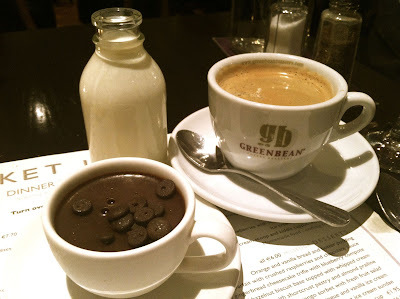 No competition here folks, I ordered the chocolate pot, which was charmingly served in an espresso cup along with my decent Americano. Some little chocolate drops sat on top, making me think of Cork-based O'Conaill's delicious chocolate. Check out the miniature milk bottle in which my coffee milk was served. As before, the Market Lane was bustlingly busy. As 7pm approached, practically every table was occupied, an impressive feat on a Tuesday night. My meal was served quickly, and service was smooth and efficient throughout. However, I was glad to leave my money on the table and step out of the heat into the cool fresh air. A busy restaurant and a quick meal meant that I was overheating somewhat. However, at least the price didn't get me hot and bothered. Really excellent value for €20.